South Bend Mayor Pete Buttigieg announces that he will seek the Democratic presidential nomination during a rally Sunday in South Bend, Indiana. 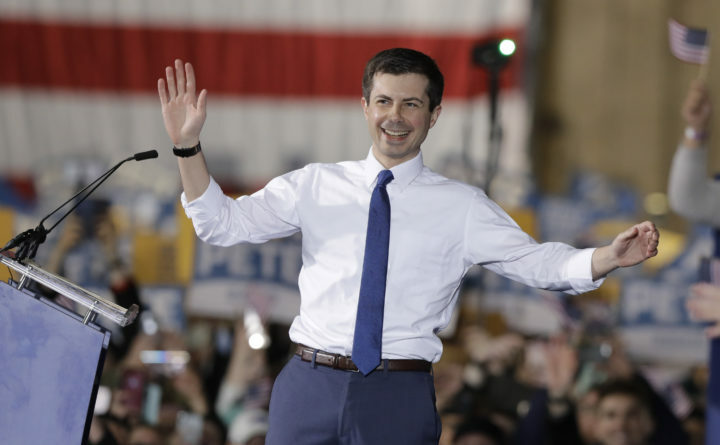 SOUTH BEND, Indiana — Pete Buttigieg, the 37-year-old mayor of this northern Indiana city who in just weeks has vaulted from being a near-unknown to a breakout star in the Democratic Party, officially started his presidential bid here on Sunday, presenting himself as a transformational figure who is well positioned to beat President Donald Trump, despite being young and facing off against many seasoned rivals. Some attendees drove from around the country after being inspired by Buttigieg’s message and the historic nature of his campaign as a gay presidential candidate. For Buttigieg, Sunday’s upbeat gathering on a dreary, snowy mid-April afternoon was an important political juncture: a reintroduction to a party that has only begun to pay attention to this mayor with an unfamiliar name, but is now certainly listening closely as it searches for a standard-bearer. Buttigieg’s path will be anything but a glide. While some once unknown outsiders, such as Jimmy Carter in 1976, have captured the Democratic nomination, others with electric starts have seen their bids fade. Buttigieg has generated a swell of enthusiasm among several top Democrats and Obama allies, such as veteran strategist David Axelrod — and Buttigieg has met privately with Obama, who has praised him. Other Democrats remain somewhat muted about the mayor. Buttigieg’s record on race has drawn criticism from Democrats as well, particularly his demotion of South Bend’s first black police chief, Darryl Boykins, in 2012. Buttigieg has cited a federal investigation of Boykins as his rationale for the ouster. Boykins went on to sue the city for racial discrimination. Buttigieg’s campaign is aware of the growing spotlight on his mayoral decisions and determined to showcase his record and make the case that running a city like South Bend enables him to understand vexing national issues from a ground-level perspective. Sunday’s rally featured introductory speeches from mayors from other states who have become allies, following Buttigieg’s work in mayoral groups and his unsuccessful run for Democratic National Committee chairman in 2016. Buttigieg’s policy proposals have been relatively broad compared with others’, tethered to his belief that American democracy needs to undergo a systemic renewal that includes a debate over possible changes to the Constitution, including expanding the Supreme Court and making the confirmation process less partisan and eliminating the Electoral College. On Sunday, he spoke out against the rise of white nationalism, voter disenfranchisement, gerrymandering and influence of corporate money in campaigns. “Sometimes a dark moment brings out the best in us,” Buttigieg said.